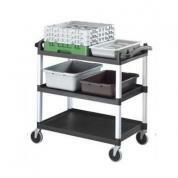 As a vital part of service, trays and trolleys are essential to your food and drink service. You will find trays in a variety of shapes, sizes, colors and finishes including non-slip. Our breadth of trolleys includes room service trolleys, service trolleys, and Cambro's insulated food transport solution.